Nov. 9, 2017, 1:21 p.m.
What’s the role of an opinion section in a newspaper today? Other news outlets are attempting to expose their readers to viewpoints they may not agree with — there’s Anna Dubenko’s “Right and Left” column in The New York Times, and Jason Wilson’s “Burst Your Bubble” column in The Guardian. But those columns mainly present roundups of content found on other sites. The Post’s effort, meanwhile, keeps readers within its own site, and uses AI rather than human curation to expose opposite viewpoints. For example, on Wednesday the Post ran an editorial by Rahm Emanuel, the mayor of Chicago, and Bruce Reed, President Bill Clinton’s assistant for domestic policy, entitled “Democrats can keep winning: Just copy (Bill) Clinton.” When you get to the bottom of that article, you’ll see the “Counterpoint”: an editorial by Post contributor Ed Rogers, a former Reagan and Bush administration official, arguing that Democrats’ wins in Virginia on Tuesday night don’t necessarily mean much for races in other parts in the country. Counterpoint will be found on all kinds of Opinions articles, including those on non-political issues. The Post’s engineering team created a backend database to help surface Counterpoint articles. “If a user is reading an article that is pro-tax reform, it would be paired with an article against the legislation,” said Sam Han, the Post’s director of data science. “The system recommends a candidate article that the reader hasn’t read.” And the team is in the process of training its AI models to learn the tagging behavior of Post editorial staff. Owen, Laura Hazard. "A new feature in The Washington Post’s Opinion section will alert readers to opposite viewpoints (with the help of AI)." Nieman Journalism Lab. Nieman Foundation for Journalism at Harvard, 9 Nov. 2017. Web. 18 Apr. 2019. Owen, Laura Hazard. 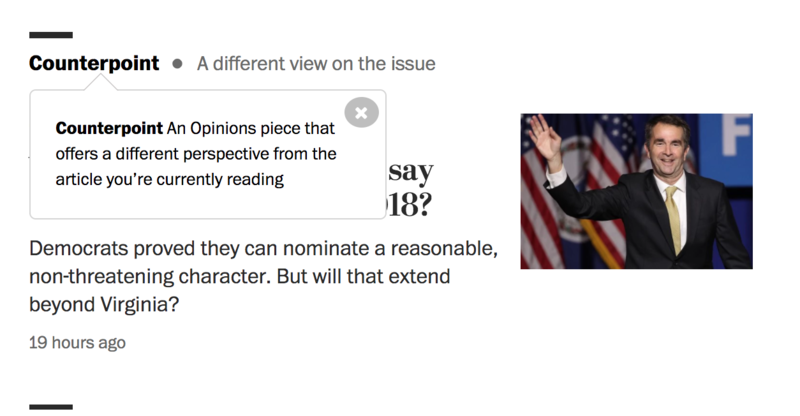 "A new feature in The Washington Post’s Opinion section will alert readers to opposite viewpoints (with the help of AI)." Nieman Journalism Lab. Last modified November 9, 2017. Accessed April 18, 2019. https://www.niemanlab.org/2017/11/a-new-feature-in-the-washington-posts-opinion-section-will-alert-readers-to-opposite-viewpoints-with-the-help-of-ai/.